Preliminary attendee list released featuring Cool Chain Association, GlaxoSmithKline, MedImmune, Merck SpA, Mylan, Pfizer, Sanofi and Saudi FDA. 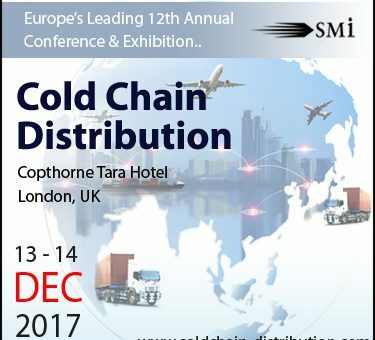 SMi’s Cold Chain Distribution Conference & Exhibition will take place on 13-14 December 2017 at the Copthorne Tara Hotel in London, UK. Growing year on year, SMi’s 12th annual Cold Chain Distribution conference and exhibition has attracted an audience of over 120 senior logistic pioneers and cold chain experts, with experience in supply chain, logistics, storage and regulation. With the vision of uniting industry experts in London to share perspectives on topics such as: temperature monitoring, demand management, contingency planning, new technologies, and reducing supply chain costs while remaining GDP compliant, this year’s event will enable delegates to capitalise on the knowledge shared by over 20 expert speakers, across 18 cutting-edge sessions, and meet exhibitors over two days filled with networking opportunities. With just under two weeks to go, a preliminary list of attendees is now available. Abbott Healthcare Products, Alliance Healthcare, Berlinger & Co AG, Birmingham Children’s Hospital, Bristol-Myers Squibb, Cool Chain Association, Eli Lilly, Emball’Iso, European Association of Pharmaceutical Full Line-Wholesalers (GIRP), Exelsius Cold Chain Management, Genzyme, GlaxoSmithKline, GW Pharmaceuticals Ltd, IAG Cargo, IATA, IPI (International Pharmaceutical Industry), Kyowa Kirin International plc, Marken Limited, MedImmune, Merck SpA, Mylan Pharmaceuticals Ireland, Napp Laboratories, National Institute for Biological Standards and Control, Online MBT, Peli BioThermal, Pfizer, Porton Biopharma, PRA Health Sciences, ReNeuron Ltd, Roche Pharmaceuticals, Sanofi, Saudi Food and Drug Authority, SeerPharma (UK), Sensitech UK Ltd, Shionogi Limited, Takeda, Teva Pharmaceutical, Topa Thermal, Wockhardt UK, World Courier, Yourway Transport and many more! “This is one of the industry’s most established shows on pharmaceutical cold chain distribution” said SMi’s, Director, Alia Malick, “We are excited to welcome a truly international audience from Austria, Belgium, Denmark, France, Germany, Italy, Netherlands, Switzerland, United Kingdom and USA”. Cold Chain Distribution 2017 is sponsored by Marken (Lead Sponsor), Berlinger & Co., Emball’iso, Peli BioThermal, Sensitech, Testo, TP3 Global, Topa Thermal, World Courier & Yourway Transport.